I have recently made a squid farm on an SMP server and want to make an AFK platform in the sky but I'm not sure what the best hight is for max efficiency. A platform in the sky will be useless as you're still in range with some rivers or oceans. What I'd suggest is to search for a desert and make it there, then fill up all the rivers within a 128 block radius and you now can afk in the sky. Im just wanting to know how far away I need to be for squid to spawn! It's automatic and really efficient, producing thousands of ink sacs per hour, depending on how big you make it. However it requires many hoppers. You can minimise the number of hoppers by using water flows. My farm is 17 x 12 but uses a single row of 12 hoppers along the middle - water flows either side direct the squid to them, where they die and the sacs are collected in the normal fashion. This might be a dumb question but why one needs so many ink sacks? To make black stained clay/black wool. ?an AFK Platform in the sky? ?why do you want a Squid Farm Platform in the sky? Seems to me that you will need to build a very tall Pool Of Water (essentially an Oversized Water Well) for the Squid to be farmed at altitude...say Y=+200. The Squid will Spawn in the Lower Levels; but, will hopefully swim up to the higher levels; that is, assuming there is no Downward Current in your Pool Of Water. I have created 2 Squid Spawning Pools. In one Single-Player World, the Squid rarely swim near the surface; even though, the Squid Spawning Pool is only a few Blocks higher than Y=+62. The Squid tend to Spawn at the bottom of the Pool; and, like to try to Dive even deeper. 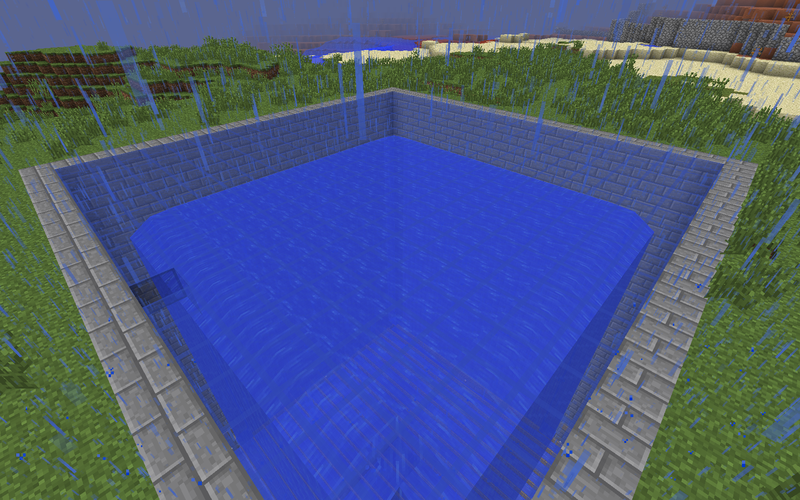 The Squid Spawning Pool is about 8 Blocks deep and about 20 Blocks Long x 10 Blocks Wide. In another Single-Player World, the Squid aren't Spawning. Probably, because the Squid Spawning Pool is only 1 Block away from an Ocean; and, has no Light Source at the bottom (based on my experience with the other Squid Spawning Pool). The Squid Spawning Pool is at Y=+62; and, is about 10 Block Long x 10 Blocks Wide x 7 Blocks Deep. The Squid Spawning Pool was dug out from a Sand Hill on an Isthmus near my Island Home base Site. After having put Torches along the entire shoreline of my Island Home Base Site, I haven't seen any Squid being Spawned in the Ocean next to my Island Home Base and the Isthmus and my Squid Spawning Pool Site. My Island Home Base is about 6 Blocks away from the Isthmus Shoreline; and, the Squid Spawning Pool is about 10 Blocks away from the Isthmus Shoreline bordering my Island Home Base. According to the Wiki, that no longer works. "Despite Silk Touch tools having the ability to pick up blocks of ice, transporting it to the Nether and melting/smashing it will not produce water." And Squid probably wouldn't spawn in the Nether even if there was water. Quoting the Wiki again "Other Overworld mobs like pigs and zombies do not randomly spawn in the Nether"
Stop reviving old threads. That's a form of spam, and it's punishable. pigs and such dont spawn because they require GRASS blocks to spawn on-and there aren't any in the nether. Grass blocks can be picked up with Silk Touch and placed in the nether but the Wiki seems to indicate that animals can't spawn in the Nether. Probably true since zombies and spiders and creepers don't spawn there either. Anyways it would be faster and easier to just push a few animals through a portal. Did some testing-found pigs and squids did not spawn. I guess it must have been removed . However I have found the way to place water in the nether-using the pure water item (ie the item named"water"). It can be obtained using the command /give <username> minecraft:water 1 .